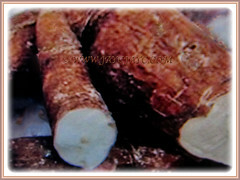 Tapioca or Cassava is the third largest source of food carbohydrates in the tropics, after rice and maize. It is one of the most important staple food crops in the developing world and provides a basic diet for over half a billion people. Botanical Name: Manihot esculenta (syn. : Manihot diffusa, Jatropha manihot, Manihot dulcis). 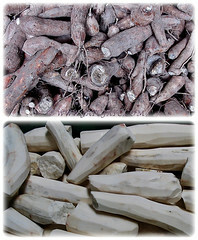 Common Names: Cassava, Brazilian Arrowroot, Yuca, Ubi Kayu in Malay. Etymology: The genus Manihot is from the Tupi-Guarani name manioca which means cassava. The specific epithet esculenta means edible by humans. Origin: Native to northeast region of Brazil. 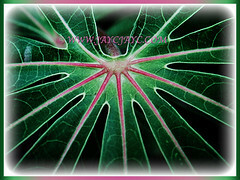 It is widely cultivated around the world, especially in tropical and subtropical areas. Plant type: An ornamental and perennial shrub with edible tuberous roots. Features: Manihot esculenta is from the genus Manihot that comprises of about 100 species. A fast-growing bushy shrub or small tree that grows between 2.75-5 m tall. It produces large ornamental leaves up to 15-30 cm long and are deeply divided into 3-7 oblanceolate lobes with entire margins. Leaves are coloured dark green above, paler blue-green beneath, almost hairless or slighly pubescent near the midrib. The petioles, measuring between 25-60 cm long are often red or reddish-purple. Stipules are present and can be entire or split. They are alternately arranged along the stems that branches dichotomously. Its round and brittle stems are light brown to yellowish-grey with cream-green inner bark. Inflorescences in lax terminal heads, 2-11 cm long. The inconspicuous and star-shaped flowers are unisexual in a panicle inflorescence, greenish tinged orange-red and often with purplish veining. Fruit is a globose capsule, up to roughly 1.5 cm in diameter, smooth with 6 longitudinal wings. Each fruit contains 3 seeds. The large edible and tuberous roots are long and tapered with a firm and homogeneous flesh encased in a detachable rind, about 1 mm thick, rough and brown on the outside. These grow in outward pointing clusters from the base of the stem just below the soil surface. Commercial cultivars require 9-18 months to grow to harvestable size. 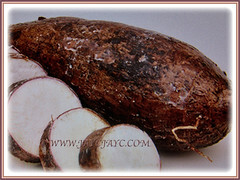 They have root tubers about 5-10 cm in diameter and 15-30 cm long. The flesh can be chalk-white or yellowish. Culture (Care): Manihot esculenta or Tapioca can be grown easily with least maintenance. Light: Full sun or semi-shade. Moisture: High water needs. Water regularly and do not allow the soil to completely dry out. It is tolerant of most soil types including dry, acidic and alkaline soils. Although drought tolerant, optimal growth occurs in moist soils. Others: Prune the plant regularly to keep tidy and aesthetically pleasing. Once monthly, feed the plant with a balanced granular fertiliser to stimulate growth and fruit production. Generally free from serious pests and diseases. It is resistant to most pests because all parts of the plant body contain high levels of cyanide in the form of hydrocyanic acid. This makes it immune to most insect predators. Kindly take note that all parts of the Cassava plant are poisonous and must be processed by peeling, pressing or cooking before being consumed. 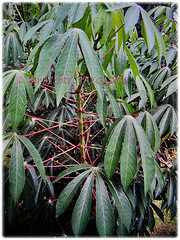 Manihot esculenta or Cassava does not tolerate frost. It’s an evergreen and perennial tree or shrub in zones 10 and 11. In zones 8 and 9, it dies to the ground after frost but comes back from its roots in spring. It requires at least 8 months of frost-free and warm weather to produce edible and tuberous roots. You can start to grow the tubers in pots anytime and then transplant outdoors after danger of frost is past in the spring. The tuberous roots will be ready to harvest after 10-12 months. Container plants and/or rooted cuttings taken in late summer may be overwintered indoors in bright sunny locations. Propagation: Easily propagated vegetatively from stem cuttings. Take 20-30 cm lengths and remove bottom leaves but ensure that it include at least one leaf node. Plant them about 10-15 cm in the ground and make sure that at least one leaf node is under the soil. 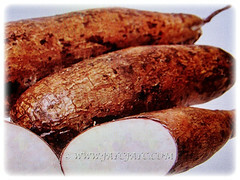 Usage: Manihot esculenta or Cassava is extensively cultivated as an annual crop in tropical and subtropical regions for its edible, starchy and tuberous roots. Its tubers are prepared in various forms as a source of food and are an important source of carbohydrates with significant amounts of phosphorus and iron as well as rich in vitamin C. Young leaves high in vitamins A and C are edible after boiling to remove cyanide compounds. Juice extracted from boiled roots is fermented into an alcoholic beverage as well as used for preserving and flavouring meats. 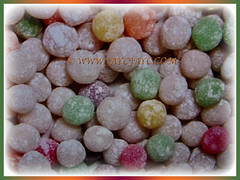 Products from its root include tapioca pudding, starch, soaps, glue and sugar. 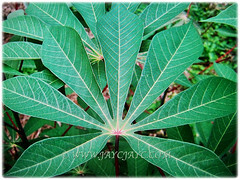 Cassava is also used as a livestock feed in Latin America, the Caribbean and Europe. It is increasingly cultivated for use as a biofuel in China. 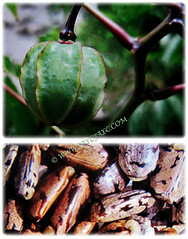 It is used in traditional medicine. Native Americans use juice extracted from boiled roots as a treatment for burns. 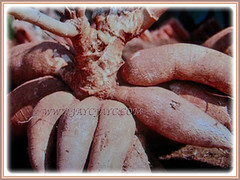 In Indochina, the starchy roots are used to dress ulcerous sores. 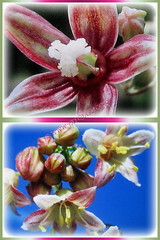 In Indonesia, together with other plants, they are used to treat pains in the body. 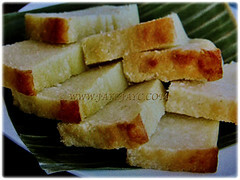 In Philippines, the bark is considered antirheumatic. Ideal to be planted for its ornamental foliage on the ground or in large containers.